Activities performed from waking up till retiring for the day are collectively called Dinacharya. Synonyms : Anhik (Daily rituals in the morning) and nityakarma (Daily duties). 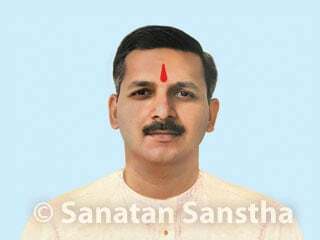 A. Dinacharya should go hand in hand with the laws of Nature : Dinacharya is planned such that a man remains healthy all his life and without any illness. The health of an individual depends upon his diet, exercise and actions. Thus, Dinacharya is important from the perspective of health. If Dinacharya is in harmony with the laws of Nature, then man will benefit and not get distressed. Hence, it is necessary to behave in harmony with Nature (as advised by Dharma [Righteousness]); for example, waking up early in the morning, rinsing the mouth, cleaning the teeth and taking holy bath. The human lifestyle today works against the laws of Nature, that’s why Man today has fallen prey to various disorders of the digestive tract, throat, heart etc. B. An individual strictly adhering to daily rituals does not become a target of calamities such as poverty, illness, etc. 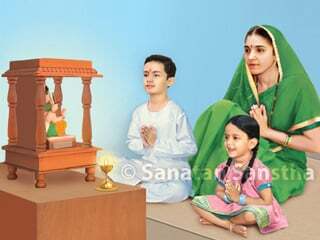 : ‘The scriptures on Dharma have given high priority to daily rituals. While setting the laws of daily rituals, the scriptures have on one hand, given due consideration to the science that is helpful and nurtures the physical body, while on the other hand, psychology that causes development and evolution of the mind is also dealt with in detail. An individual strictly adhering to daily rituals does not become a victim of calamities such as poverty, illness, vices, psychological disorders etc. All karmas right from waking up in the morning till retiring to bed at night are included in Dinacharya. Details of some of them are given below. A. Nityakarma : Activities which when performed result in gaining only purification of the subconscious mind, and yet their non-performance leads to demerits – these are called nityakarma. For example, chanting the Gayatri-mantra and performing sandhya are nityakarma for a Brahman. Nityakarma as prescribed by varna (Class) : The nityakarma of a Brahman is adhyayan (studying) and adhyapan (teaching), that is, learning about spiritual practice and teaching it to others. Nityakarma of a Kshatriya is protecting society from evildoers; nityakarma of a Vaishya is serving the society through cattle-breeding, farming and business, and that of a Shudrais conducting any trade except that conducted by Brahmans and Kshatriyas. Nityakarma as prescribed by the Ashrams (Stages of life) : Studying how to follow Dharma while in the stage of Brahmacharyashram; repaying debts unto God, Sages, departed ancestors and the society in Gruhasthashram; performing spiritual practice with the aim of purification of the body and studying philosophy in Vanprasthashram; and asking for alms, chanting, meditating etc. in Sanyasashram are the nityakarmas according to ashrams of life. B. Karmas to be performed from dawn till dusk : Twelve hours of the day are divided into five parts – pratahkal (Dawn), sangavkal (Morning), madhyanadin or madhyanhakal (Mid-day, i.e. Noon), aparanhakal (Afternoon) and sayanhakal (Evening). The activities to be performed in each part are given ahead. Pratahkal (Time starting from sunrise) : Sandhya, ritualistic worship of Deities and Pratar-vaishvadev. Madhyanhakal : Madhyanha-snan (Mid-day bath), Madhyanha- sandhya, Brahmayadnya, Bhutayadnya. Sayanhakal : Listening to the Puraṇs, discussing them, Sayan-vaishvadev, and sandhya. Today, Hindus are drifting away from the Achardharma (Code of conduct) prescribed by Hindu Dharma. Following Achardharma is the foundation of Spirituality. Everyone should take cognizance of the principle that, man can be truly happy only by adhering to Spirituality, and not by use of modern gadgets. Every achar (conduct) in Hindu Dharma has been designed to reduce Raja- Tama components and enhance sattvikta (Sattva-predominance; Purity), and get protection from distress due to negative energy through every activity. Indeed this is the unparalleled uniqueness of Hindu Dharma. Along with other paths of spiritual practice such as Dnyanayoga (Path of Knowledge) and Karmayoga (Path of Action), Acharadharma also leads to God Realisation. Inspiration originating from appropriate activity induces enthusiasm needed for the task. Though Antahsphuran and Antahprema (Inspiration to perform some action) both means inspiration, yet antahsphuran is subtler than antahprema. Antahprema awakens the manah-shakti (Energy of the mind), while through Antahsphuran the manah-shakti from the physical body unites with the iccha-shakti (Energy of will) from the universe. It is from this that the union of the correct activity and the inspiration in the activity occurs at the level of the Pruthvitattva (Absolute Earth Principle) and Apatattva (Absolute Water Principle) and achars evolve. Achars have four categories – Actual, Moderate, Superior and Supreme. Pratyaksha-achar or Actual conduct : A jiva (Embodied soul) gets connected to the momentum of any activity through Pratyaksha-achar. Movements in the activity are rhythmic in nature; when Anand is obtained from them, they are known as Pratyaksha- achar. Madhyam-achar or Moderate conduct : When a jiva begins performing activities through the process of antahspuran, it gets engrossed in them. This state of engrossment controls the movements in the activity. This controlled activity leads to achieving of achar. Controlled thought is very much a component of controlled activity. . This is termed as the Moderate conduct. Performing the best karma : Identifying the correct and guiding thought in every incident, and acting as per the thought, is termed as ‘Performing the best karma‘. The emotion teaches the jiva from within, the concept is ‘I am performing this deed for others’. This is called the Superior conduct. Thus, in other words giving up oneself for the benefit of others is Superior conduct. Such conducts brings about purification of the soul, because through the atma-shakti, the jiva gets connected to the triad of ‘time-action-motion’ in the appropriate proportion. Achars taking the form of Dharma : Whenever a jiva, out of self purification, begins to offer every single karma for the benefit of samashṭi (Society), its achars truly take the form of Dharma. Dharma is the Chaitanya (Divine consciousness) filled and everlasting lifestyle, through which the essence of communicating with the Supreme God is realised. Mahattam-achar Or Supreme conduct : Activities prescribed by the Hindu Dharma in our day to day life, right from waking up till retiring for the day , are in fact daily sadhana (Spiritual practice). The objective of sadhana is achieved through this achar, meaning the soul of the jiva purified, which in turn leads to performing the appropriate achar- karma, thus beginning about dissolution of its body awareness. This is what is called ‘supreme conduct’. Finally it is this supreme conduct devoid of ego, which takes the jiva to Moksha (Final Liberation). An Individual strictly adhering to daily Rituals : The Scripture on Dharma have given high priority to daily rituals. While setting the law of daily rituals, the scripture have, on one hand, given due consideration to the science that is helpful and nurture the physical body, while on the other hand, psychology that causes development and evolution of the mind is also dealt with in detail. Daily oblation to God performed at dawn, through the Fire Deity, before the meals. The first among the four stages of life – the stage of celibacy. The last among the four stages of life, namely, the stage of a renunciant. A sacred verse from the Vēdās, to be recited mentally by a Brāhmaṇ during the daily ritual of sandhyā , a mantra of the Sun Deity, hence related to the Tējtattva. Conduct conforming to Shruti and Smruti, general conduct. (Also, custom, tradition).